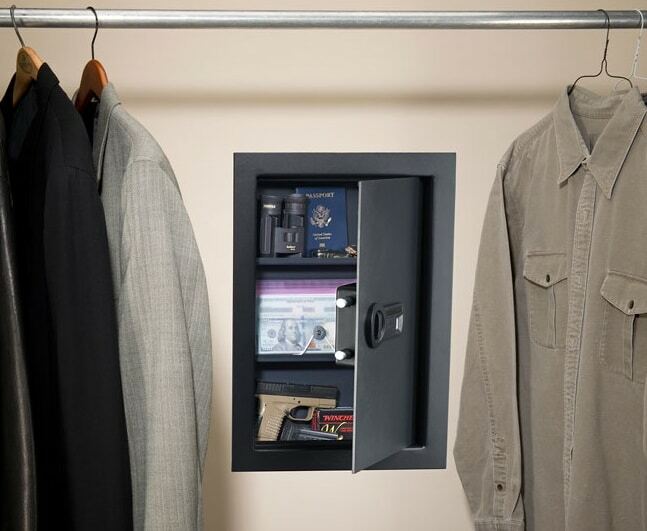 In wall gun safes are convenient and don’t take up a lot of space in the room. You have a variety of options available, such as long gun in wall safes and smaller safes designed just for handguns. Many have adjustable shelving for custom fits as well. Important features to look for if you want the best in wall gun safe are security and durability. Therefore, we have ranked the following list based on security, durability, and customer ratings. 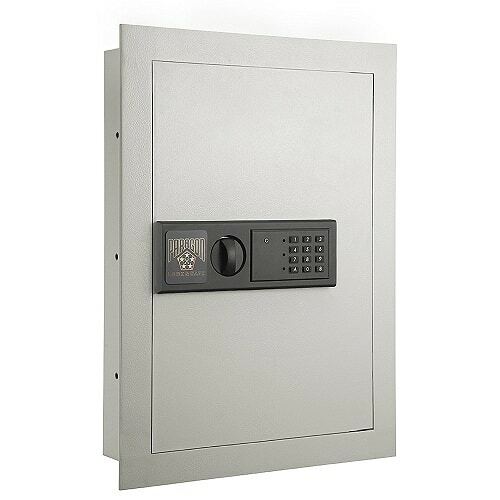 The Paragon 7750 Electronic In Wall Safe features tamper-proof hinges and anchor bolts. It’s the best in wall gun safe for security. One customer said that he came home to see thieves had tried prying it out of the wall. He was happy that the safe was still securely in place and didn’t take any damage. 22″ x 16″ x 4″. Grey carpet mat padding in the bottom. You can access the safe via a key or the electronic lock. Beeps when you press a key. The Stack-On PWS-1555 long gun wall safe is the best in wall gun safe that has three removable shelves and a stylish sleek appearance. You can fit two rifles or shotguns inside the safe. It’s secured by concealed hinges and three locking bolts. Gun capacity of two rifles or shotguns. You can set the number pad for the electronic lock to either beep or stay silent. The shelves are removable in order to find a better fit. 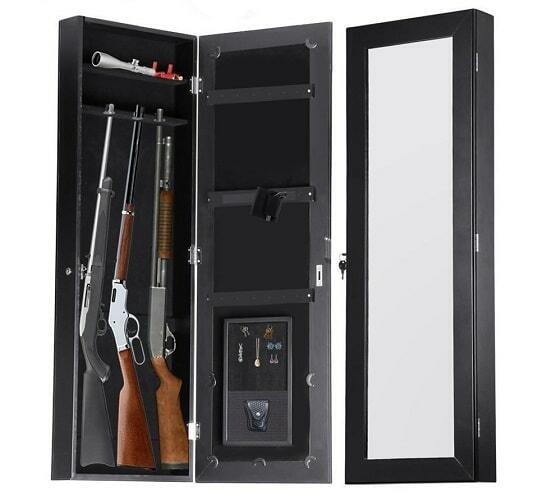 The Gun Cabinet Armoire gun safe is the best in wall gun safe for concealment. It looks like a mirror to help disguise it from criminals. The Gun Cabinet Armoire Hidden In The Wall Mirror Rifle and Pistol Safe can hold several small rifles. 42.5″ x 14″ x 3.5″. Gun capacity of 2-3 single barrel rifles without scopes. Looks like a mirror for concealment. 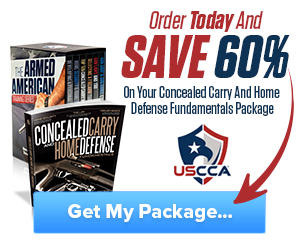 Has an upper storage shelf and bottom compartment to store other items like ammo. 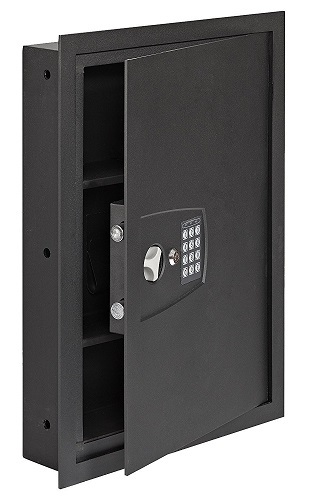 The V-Line 31242-SA Quick Access safe operates via a push-button mechanical lock. 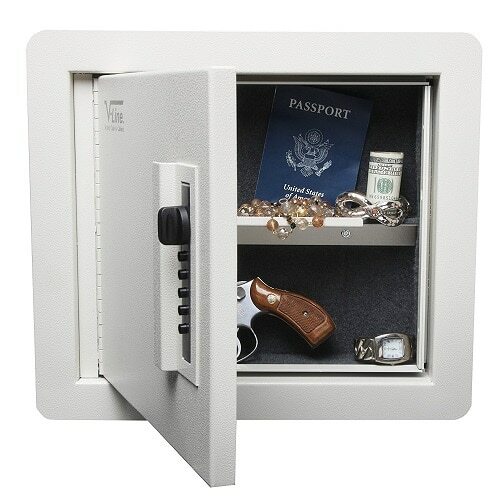 It’s a good choice for those who don’t want an electronic lock on their gun safe. 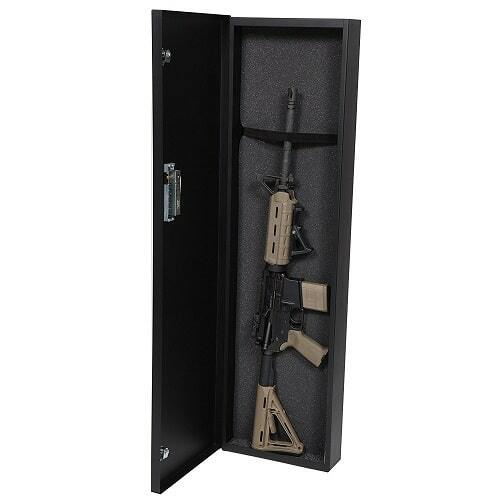 The long gun safe is made of steel for durability and can fit AR-15-type rifles. 42″ x 12″ x 3.5″. Mountable either vertically or horizontally. You can install it either vertically or horizontally. The SnapSafe In Wall Electronic Safe has two storage shelves and a hidden security compartment on the bottom shelf. When the battery is low, it gives an audio and visual signal. 22″ x 16.25″ x 4″. Hidden security compartment on the bottom shelf. Warns you when the battery is low. Not for rifles or shotguns. The V-Line Quick Vault Locking Storage is easy to mount flush on the wall in between studs. The shelf inside of the safe is adjustable, so you can find the right fit for your guns. It also features anti-pry brackets to ward off pry attacks. You can adjust the inner shelf for the right fit. The six in wall gun safes listed above are some of the best options in 2018. They are secure and fit neatly in the wall. One of the items on the list is designed for concealment, appealing to those who don’t want their safe being noticeable. It looks like a long wall mirror, rather than a safe. Which safe do you think is the best in wall gun safe and why? Let us know in the comments below. Hey Buddy!, I found this information for you: "Reviewing the 6 Best in Wall Gun Safes in 2018". 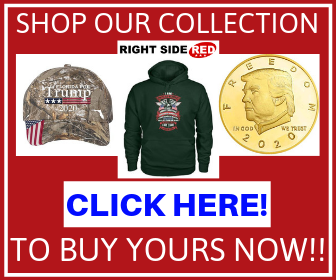 Here is the website link: https://thegunrights.com/best-in-wall-gun-safe/. Thank you.